Brooklyn’s Other Half Brewing occupies an innocuous industrial block in the borough’s Carroll Gardens neighbourhood. Its red brick walls are washed with smog grey emulsion, and the steel and tarmac behemoth of the Gowanus Expressway thrums overhead, straddling streets built on drained swampland east of the Hudson River’s terminus at Upper Bay. In the four years since founders Andrew Burman, Sam Richardson and Matt Monahan began brewing on the site, they’ve steered Other Half from a three-men-doing-everything start-up to a thriving community-based brewery employing more than 25 staff. And despite a deliberate focus on its immediate neighbourhood, its appeal – thanks in no small part to its sell-out releases of Instagram-friendly New England IPAs – has spread far and internationally wide. If you live outside its self-distro draught catchment of Brooklyn, the neighbouring boroughs of Manhattan and Queens, or the lower reaches of the Hudson Valley, expect to travel for a pour. For a share of the few hundred cases of cans Other Half release each week, you’ll be spending the early hours of Saturday morning waiting patiently in line at the brewery. They are not available in bottle shops, nor online. The roller shutters clatter up at 10am. All of which leaves the US beer-curious this side of the Atlantic with a couple of options: jet to JFK and ride the subway to Smith 9th in Carroll Gardens to join that queue, or find a friendly US counterpart to box up some cans and ship them to you. For payment in kind, of course. If you know where to look, online hook-ups for transacting everything from sexual adventures to Star Wars toys are a mere click away, and beer is no exception. Welcome to the semi-naughty, grey-market world of international beer trading. Mike, 30 – who asked us to withhold his surname – began trading around 18 months ago, reeled in by Other Half’s Instagram feed, where the brewery announces new beers to some 100,000 devotees. Their responses to the images of strikingly-designed cans and limited-edition glassware are a litany of coded trade offers: ISO means ‘in search of’, FT signifies ‘for trade’, IP identifies the trader as eager to swap beers ‘in person’, and S, followed by a location, explains where they are willing to ‘ship’ to. That’s not to say trading is a new phenomenon. The sheer demand for modern US beer coupled with arcane inter-state distribution laws – which in turn complicate online alcohol sales – means many breweries sell only direct and in person, eschewing the familiar UK culture of third-party distribution, bottle shops and webstores. If you happen to like Trillium but live in Orlando, you’re looking at a 1300-mile drive, akin to driving from Berlin to Huddersfield to buy some Magic Rock. Inevitably, this direct sales model has fostered a sub-culture of swapping and re-swapping beers like a kind of adult Pokemon trading card game. The Beer Advocate website has hosted a trades forum since the 90s, while the Beer Trade sub-Reddit boasts over 21,000 readers. Historically, trades have been US-centric and focussed on beer world rarities: hard-to-get sours, barrel-aged adjunct stouts, limited releases of highly prized trophy beers (or ‘whales’ as they are known in beer geek speak). Often packaged in glass 750ml or 660ml bombers, they can prove fragile in courier transit, with losses dealing a heavy blow to the wallet. 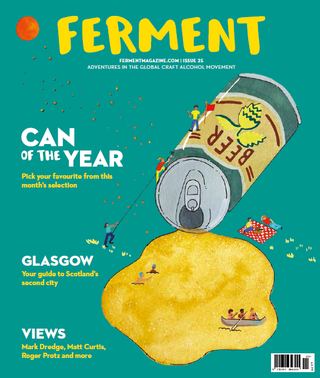 But a few things have changed in recent years to make trading both more widespread and also accessible to the UK: packaging in cans, the more transparent connectivity afforded by social media and improvements in the quality of UK-made beer inspired by some of the most popular modern US styles. Mike now trades around three times a month with a trusted network of US counterparts who live near, or travel to, revered Stateside breweries. He was moved to set up the UK Beer Traders Facebook forum after being deluged with ‘how-to’ questions while sharing photos of his hauls on Instagram. The forum has a growing membership of around 300, a figure dwarfed by the trading groups for some of America’s most in-demand breweries – Trillium, Tree House, Tired Hands, Monkish – whose memberships number in the thousands. He uses Parcelforce to send to America, spending about £40 to ship a box of 20 cans. US Federal law means excise duty should be paid on even small volumes of alcohol imported for personal consumption and, in an effort to help recipients dodge this duty, parcel contents are typically described as ‘decorative glassware’. Anecdotally, there are stories of traders swaddling parcels in multiple layers of clingfilm to discourage nosy customs officers, or stashing tins of small change or marbles in the box to mask the sound of sloshing liquids. Here in the UK, the official line from Her Majesty’s Revenue and Customs is that the content and value of a package imported from outside the EU must be declared by the sender, with the importer legally responsible for the accuracy of this declaration. If the declaration is found to be false, UK Border Force can send the package back, or seize it. Alcohol can be imported as a gift, free of VAT and Import Duty up to a value of £39 - but Excise Duty still applies. Anything above £39 incurs a VAT charge. “The reality is, parcels rarely get stopped,” adds Mike. “A lot of couriers won’t accept fluids or alcohol, so if you use them and get caught out, they’ll send your consignment back to you and you might lose your shipping costs. You just have to be grown up about it and accept that what you’re doing carries a small risk. Thanks to traders, beer from Manchester’s Cloudwater sometimes arrives in New York even before it has landed in UK retail outlets. Brewery co-founder Paul Jones is enthused by the notion of his fans not only facilitating a kind of micro-export – spreading the good word on UK beer in the States – but also experiencing other world-class beer in return. Paul, no stranger to standing in line at Tree House, Trillium or Hill Farmstead for his eight or ten-can allocation, says: “There are fanboys and girls in all walks of life. You have people at a gig who pay goodness knows how much for front row seats because they want that level of experience, and for some people the ability to get hold of rare, special beers from elsewhere is what gets them going. “I’m pleased to hear people think we’re worthy of being traded out and, as a brewer making beer with international appeal, I’m glad there are folk in the UK who can get hold of beers from elsewhere. But sadly, not everyone shares their enthusiasm. If there is one European beer style almost guaranteed to bag a clutch of American rarities, it is the spontaneously-fermented Lambic produced only in the Pajottenland region south-west of Brussels. Of the nine breweries permitted to call their output ‘Lambic’ (it is a protected food name under the EU ‘Traditional Speciality Guaranteed’ scheme), Drie Fonteinen, Boon and Girardin make regular appearances in online trade requests. Upstart Lambic blender Bokkereyder, who has been courting US festivals with his modern interpretations of the style, features heavily, too. But it is beer from Brasserie Cantillon – often abbreviated to ‘Loon’ in trade talk – which is most in demand. Here in the UK, one importer, Stoke-on-Trent’s Beer Direct, reports an astonishing five-year waiting list for a seasonal Cantillon release like its elderflower-infused Mamouche, prompting avid traders to take matters into their own hands and stock up in person alongside the 45,000 people who visit Brussels’ oldest and most revered brewery each year. Cantillon’s popularity in trading circles – and also for re-selling on the grey market at vastly inflated prices – is proving a headache for patron and brewer Jean Van Roy. Still, the social media chatter would suggest traders have no plans to slow down any time soon – quite the opposite – and Mike is impenitent: “We’re treated like the devil in some quarters, and you’re never going to change someone’s mind if they truly believe you’re an idiot, but in our Facebook group re-selling is banned and personally I try to vet people I’m trading with to make sure they actually want to drink the beer. Cantillon’s 118-year heritage – that promise of ye olde worlde brewing charm – means it will always be an attractive proposition for traders, and it is unlikely that even the burgeoning growth of UK sour beer projects and blenders will distract attention from the Belgian masters. But as British breweries up their game and match the quality of the most coveted modern US styles, perhaps we will find our American cousins increasingly open to trusting our homegrown, UK talent for those straight-up, hops-for-hops swaps.